You don't see many stars in Manhattan. UT astronomer and professor Harriet Dinerstein grew up in the middle of New York City. The light pollution of this vast city made it impossible to see the stars at night. However, Harriet was inspired by her visits to the world-renowned Hayden Planetarium, now replaced by the Rose Center for Earth and Space Science. While in high school, she participated in a National Science Foundation-sponsored program at the Hayden Planetarium. This program introduced Harriet to astronomy as a science, enabled her to meet real live astronomers, and cemented her love of the subject. It was 1969, the summer of the first moonwalk. Continuing with her astronomical interests, she received her undergraduate degree from Yale University, and then attended graduate school at the University of California at Santa Cruz, the home of Lick Observatory. Her dissertation work involved combining observations from two different spectral regimes, infrared and optical; today, this kind of "multi-wavelength" astronomy is widely used to study all kinds of astronomical objects and problems. Harriet's first postdoctoral position was as a National Research Council fellow at the NASA Ames Research Center in California, which at that time was home base for the Kuiper Airborne Observatory, a flying telescope that was the forerunner of SOFIA , the Stratospheric Observatory for Infrared Astronomy that is currently being built. 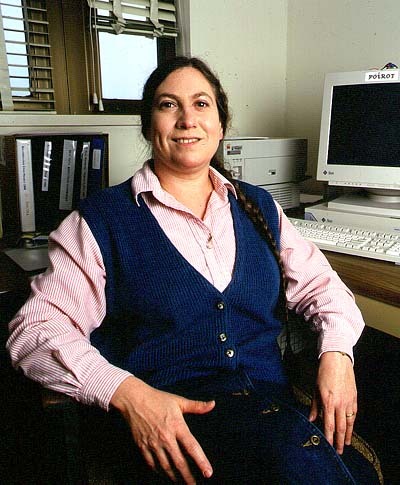 Harriet Dinerstein first came to the University of Texas in 1982 as a Robert A. Welch Foundation postdoctoral fellow, and joined the University's faculty in 1985. Since then, she has done research on star formation, extragalactic ionized nebulae, classical novae, supernova remnants, and most of all, planetary nebulae. Harriet has been awarded two of the major research prizes of the American Astronomical Society (AAS) the Annie Jump Cannon Award in 1984 (awarded jointly by the AAS and the American Association of University Women, AAUW) and the Newton Lacy Pierce Prize in 1989. She has also taught a dozen different courses at UT and won two Teaching Excellence awards. Her husband, Dan Lester, is a Research Scientist working for McDonald Observatory, with an office right down the hall from hers. They have two daughters, Amanda and Jenna, who are both fanatical soccer players. In her free time, Harriet relaxes with the Austin Balkan Singers, a group of women that perform folk music from such places as Bulgaria, Macedonia, and Croatia.